Last month brought many things for the LÉÉ group including: Dr. King traveled to Scotland for the High Latitude and Cold Climate Dust meeting with a stop over in Oxford to give a talk at the School of Geography and the Environment; new members to the group were confirmed including two undergraduate and one PhD student (they will make their own introductions soon); and lastly the sweet and sour of getting news of one proposal funded and the other declined. The declined proposal was from FRQNT on a project based in the Yukon; however it is continuing at this point with a camera-based observation methodology this year. The proposal granted was the mighty NSERC Discovery, which is for 5 years and renewable. More exact details of the proposal can be found in the summary here, but also below the 5-years of projects has been briefly summarized. This proposal is intended to fund student involvement in the research and their training at the undergraduate, graduate, and doctorate levels. The proposal is rooted in improving the measurement and modeling of mineral dust aerosols through a series of comparative studies and model testing. Firstly, particle size distribution changes through the transport process will be measured in both idealized (wind tunnel) and naturally occurring environments, to ascertain the role aggregates play in modifying modeled emission rates of dust. Secondly, fluxes of mineral dust aerosols will be measured using a host of techniques including, gradient method, mass balance, and eddy covariance, to improve the accuracy limitations of measured values. Both of these objectives will both in turn help improve the understanding of mineral dust aerosol transport, which improves the predictive role of dust production models. The wind tunnel work will initially be carried out (more on that soon) in the sediment transport wind tunnel of Dr. McKenna Neuman at Trent University and the field work in the dry valleys of northwestern Namibia. If you have an interest in participating in this research please contact me for applying to potential funding possibilities starting next year through NSERC, FRQNT, and others through collaborations. Last week was my first foray into many things, all at once: 1) My first solo proposal prepared and submitted (although it has collaborators mentioned in the proposal, none are allowed to be actually named as Co-PI), 2) my first foray into research on high latitudes, and 3) my now memorably scramble to submit the proposal within the dying minutes because of a translation issue. The first two of these I look forward to repeating, while the last one I look forward to not repeating anytime soon with the help of my multiple days/week cours de français. The FRQNT Éstablissement de Nouveaux Chercheurs is a provincial fund for science and technology research over a two year period specifically designed to help new researchers develop their program. A Quebec-based researcher can only receive the award once and can only apply twice within the first three years of being hired. It funds requests for a maximum of $20,000 per year of funding in addition to a maximum of $50,000 for equipment in excessive of $7,000. The proposal process was similar to the NSERC discovery requirements (as I am finding out), including a free-form proposal of 7 pages (inclusive of figures and references) and 3-4 page research profile, a separate pre-formatted space for budget justifications for equipment and the proposed work, and of course the dreaded Canadian common CV (although in a very trimmed form). The proposal itself plans to look into dust emission processes occurring in proglacial valleys. These processes have been known to be occurring for sometime and in a few cases even measured – in the Yukon, and more recently in Alaska and Alberta. However, the soils of this region in the northwest of North America is blanketed with loess from previous dust emission activity after the height of the glacial maximum. 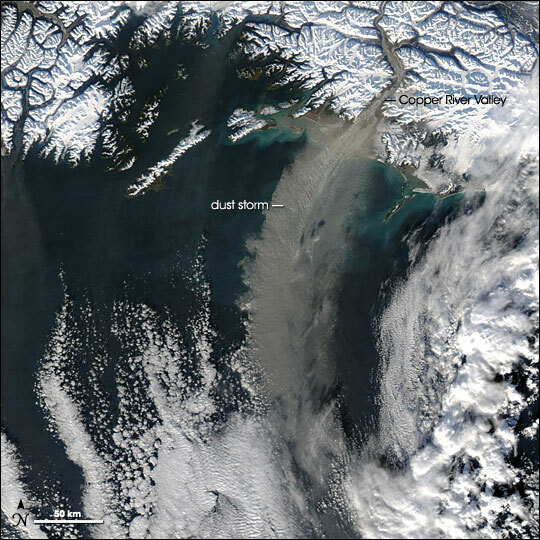 It has been suggested that much of this dust was deposited slowly, however the more recent observations in Alaska and Alberta suggest deposition rates that exceed even the present day subtropical dust storms that are extremely active. he Moderate Resolution Imaging Spectroradiometer (MODIS) flying onboard the Aqua satellite took this picture of the storm as it dispersed over the Gulf of Alaska on November 5, 2005. This disagreement between present day measurements of fluxes with sedimentary records is not new, and common across many geomorphic sub-disciplines (and worthy of research of its own). This specific example does however show promise due to the sheer lack of direct measurements of the active processes contributing to the same soil development recorded in the mid-Holcene soils. Furthermore, the increased rate of ablation of glaciers in this region allows for a direct comparison to likely the similar rate of change responsible for creating originally these loess soils. The satellite image at the top of the post is a series of false colour SPOT5 images from the proglacial valley of interest over three months (May to July) showing the dynamic nature of these valleys and subsequent window when dust emissions can be driven by katabatic wind flows. For more information on this project please see the linked outline below and please feel free to contact me if you have questions, comments, or would like to contribute to this project. Welcome to the website of the LÉÉ Lab led by Dr. James King, of the Département de géographie at the Université de Montréal. This group studies the interactions of the wind and sediment and their impact on the climate, focusing on increasing the ability to predict wind erosion by focusing on small-scale variables that can change the threshold of sediment transport up to large-scale transport mechanisms that alter ecosystem functions. Although our focus is on arid and semi-arid environments such as previous research conducted in the Sonoran and Chihuahuan deserts of the USA, Gobi desert, and the Kalahari and Skeleton Coast of southern Africa, we are also starting to research high latitude regions impacted by wind erosion in the Yukon, Canada and locations impacted by the deposition of transported materials in the Caribbean. Temporary undergraduate and funded graduate positions are currently available on a series of projects that you can find here.